This a very popular question in translator forums and it comes with many answers. Here I'll show you which TM translator software is the most popular, well-known and widely used amongst the German translation community, and give you a little information about them. 2. Does the price/performance ratio make sense for my business financials? 3. Does it need to be compatible with the TM software used by my agencies/clients/other translators I work with? 4. Am I an established professional, or just starting out in my translating career? Trados is produced by SDL (www.sdl.com) and is practically the industry standard in Europe, the result of a successful and aggressive marketing strategy. You may find the range of products offered on the SDL website a little confusing, but the translation memory software we are considering is SDL Trados Studio 2009, which they claim is “one integrated environment for all your translation, review, terminology and project management needs” and is sold as meaning of “increasing productivity”. But it doesn’t come cheap: The bottom-of-the-range version for freelancers is priced at around 600 Euros. If you want further information about the package, you first need to submit extensive details about yourself via an online form. SDL sells itself as a major content and language management service provider, offering translation, localisation, globalisation and consulting services. Not surprisingly if you want to work with them as a freelance translator, you have to own their product – which is a good way of getting sales. They also run courses (you pay) to teach you to use their TM and even a “certification” option, so you can prove your abilities on their TMs. They claim to have invested US$ 100 million in their global information management systems so they are obviously here to stay. Across is a German-based company (www.across.net) offering 2 major products. The Across Language Server is intended for large companies with multiple users while the Across Personal Edition is designed for freelance translators, and – wait for it – is free to download. It’s a translation memory and terminology management system which functions either as a standalone application, or as a remote client which can access a client’s Across Language Servers using a temporary softkey. I also have it from a reliable source that it is compatible with Trados. Atril’s (www.atril.com) translation memory software for freelancers is called Déjà Vu X Standard and costs around 500 Euros although it doesn’t have as many bells and whistles as the twice-as expensive, Déjà Vu X Professional system, also designed for freelancers. It seems popular according the customer comments on its website. Atril also hosts Transref, a directory of translators, which all freelancers can sign up to, and which announces training sessions and industry events. The STAR group (www.star-group.net) offer several corporate communication products, and TransitNXT is their TM tool. It is more widely used in the US/Canada than Europe, and is regarded as a good tool for technical translations (e.g. construction drawings etc.). Marvellously, there is no information whatsoever about prices and how to purchase their tools on their website, but by researching a bit I have found quotes of around 800 Euros for the freelancer version (may be dated). MultiTrans is TM translator software offered by MultiCorpora (www.multicorpora.com), a Canadian language technology solutions provider, and is more widely used in the US/Canada than Europe. It’s a CAT tool like the others, offering text alignment and terminology management systems. They offer both a stand-alone MultiTrans Freelance Edition (around 500 Euros), or a subscription version which allows freelancers to access their clients’ servers. Wordfast (www.wordfast.com) is not strictly a CAT tool, but rather a plug-in for Word. Its pitch is good value, and it claims to be “the second most widely used CAT tool worldwide”. Users have access to their server-based translation memory. You download free trial versions of Wordfast Professional (a comprehensive stand-alone java localization suite), or Wordfast Classic( an MSWord add-on translation tool), before signing up for full functionality and a 300 Euro licence (half price to translators in many countries outside North America and Europe). Provides instructions on migrating from Trados Workbench to Wordfast. NEW! Wordfast has just launched Wordfast Anywhere, a free, browser-based version of their Wordfast Classic translation memory software. Upload your documents and translate online. They swear they take your privacy seriously. Go and take a look at www.freetm.com. The AnyMem 2.0, by Advanced International Translations, is a cost-effective CAT Tool and, at 89 Euros for a personal licence, the best priced starter package on the market. They also offer a 30 day free trial. It works in the same way as all CATs, comparing translated segments of text (“translation units”) against a database of previous text translations, and working closely with MS Word. OmegaT (www.omegat.org) is open source translator software and therefore available free of charge. One reviewer (in German) on the OmegaT website likens it to the 2CV of CAT programs – quick, simple and you can make alterations yourself! Popular for fans of OpenSource, Mac and Linux, but be prepared to convert all documents into OpenOffice first as it can only work on text-based data. Probably for those of you who enjoy playing with computers, rather than someone (like me!) who regards them as a tool. 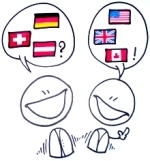 Forum Open Language Tools (FOLT, www.folt.org) is a German project in which a group of partners are working together to create an open source translation memory software system. The partners include businesses, local authorities and universities, all active in the language industry, and so it’ll be good to see what sort of translation program they come up with.Watch this space! If you’re new to the game, start off by playing with a free TM such as Wordfast Anywhere (www.freetm.com) to get the feel for how TM translator software works. If you don’t like the idea of “working in a cloud”, try a cost-effective tool such as the AnyMem 2.0 translator software which will probably do all you need. If you’re working in an environment where you need top of the line translation memory software such as Trados then you’ll probably already know it!